I really like cooking breakfast foods. They're easy, simple, delicious, and we always seem to have the ingredients laying around to make something tasty. 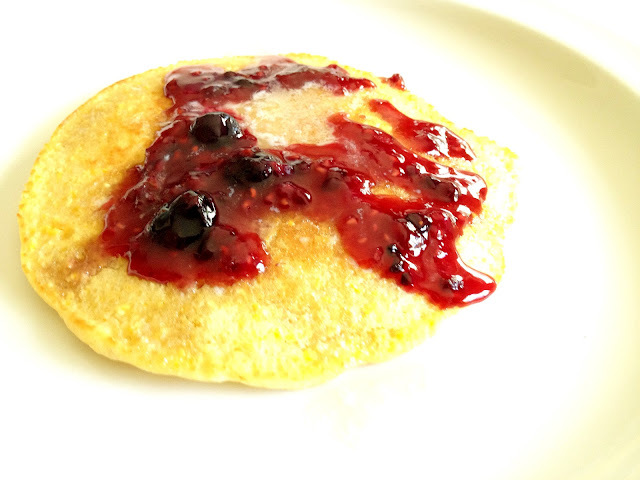 In this case, it was Cornmeal Pancakes with Mixed Berry Syrup. The original recipe calls for blackberries, but we didn't have any fresh berries, but we always have a giant bag of frozen mixed berries. And we had just bought a bag of cornmeal, so it was a great opportunity to try out this recipe. It turned out delicious, and the pancake was crunchy, mixed with the berries, and I also added butter and maple syrup to it. 1. Mix together flour, cornmeal, salt, baking powder, and sugar in a bowl. Set aside. 2. In a separate bowl, mix milk, eggs, and vanilla. Pour into the dry ingredients, stirring gently. 3. Stir in melted butter. Set batter aside. If batter is overly thick, splash in a small amount of milk. 4. In a saucepan, combine blackberries, sugar, and water. Bring to a gentle boil and cook for 5 minutes on low. Stir in cornstarch, then continue cooking, using a whisk or spoon to mash the larger pieces of blackberries. Remove from heat when it's nice and thick. 5. Heat 1 tablespoon butter in a skillet over medium-low heat. When heated, drop 1/4 cup batter per pancake and cook until golden brown on both sides. Remove from skillet and set aside. 6. Stack three pancakes, placing a pat of butter between each pancake. Drizzle with warm maple syrup, then spoon blackberry syrup over the top.